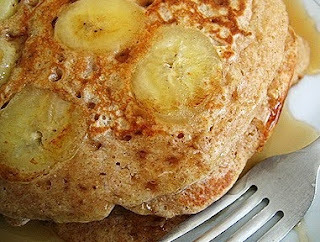 Oatmeal or pancakes for breakfast? How about both. Oats contain a type of fiber known as beta glucan. This magical fiber has the ability to lower cholesterol levels more than any other type of fiber! Studies have shown that consuming 3 g of soluble oat fiber per day (equivalent to one bowl of oatmeal) can lower your cholesterol levels between 8 and 23%! To top it off, antioxidant compounds unique to oats, called avenanthramides, help prevent free radicals from damaging LDL cholesterol, thus reducing the risk of heart disease. Bring water to a boil (I heated mine in the microwave). Add oats and place in refrigerator for 15-20 minutes. Mix dry ingredients. Add beaten egg and butter to cooled oatmeal and mix well. Stir in oatmeal mixture to dry ingredients. Heat a nonstick skillet over medium heat. Place 1/3 cup cake mixture onto hot skillet. Allow to cook until bubbles form, ~ 3 minutes. Add 4 slices of banana to the uncooked cake top. Flip cake over and continue to cook, banana-side down, ~ 4 minutes, until banana slices brown slightly. Remove cake to a plate and cover with a towel to keep warm. Repeat with remaining batter. Serve with berries or syrup of your choice! This looks great. I'm going to try it tonight! I may have missed it - but what do you do with the butter? Oops! You stir it into the oatmeal! I will fix that! I really enjoyed this recipe and my immediate thought was that "mmmm...I may have found a substitute for oatmeal cookies."